March 1, from 5:30 – 8 PM. Born and raised in Nashville, TN, Doggett’s work takes a deep dive into traditions and narratives that dwell in southern Black communities. Nuances of the day-to-day, long forgotten histories (and still visible remnants), personal childhood memories, and stories passed down from relatives, all coalesce to offer a holistic perspective of Southern Black life, in which moments and experiences often taken for granted, or misunderstood, are highlighted. Doggett’s work gives a visual platform to those identities and stories that have been assiduously passed down for generations. 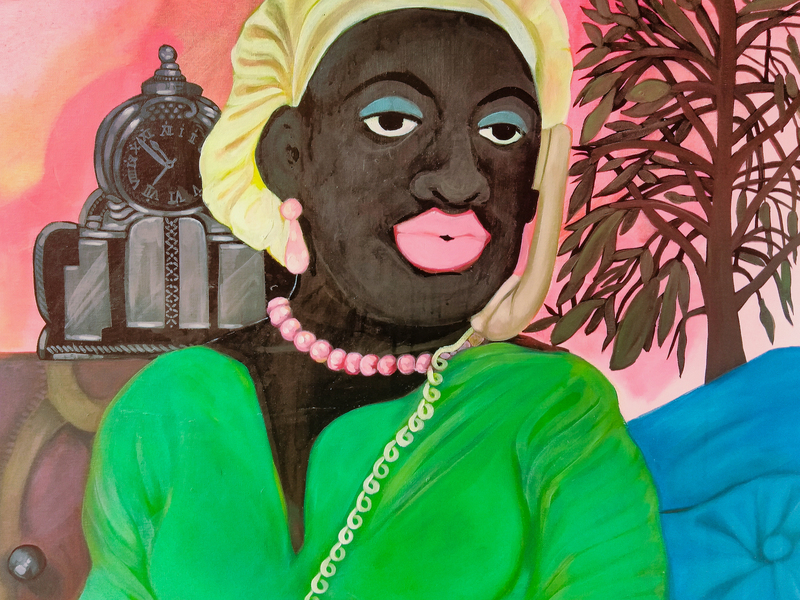 By making them visible in the act of painting, she honors the way her relationship with these narratives shifts with the past and present, with herself and others. In Our Neighborhood, Doggett conjures a range of generalized, ambiguous spaces - sprinkled with specific objects - forcing us to piece together time and location. In a sense, her work operates like a vague memory that we stitch together. An old clock, possibly a family heirloom, ticks towards midnight as our mother talks on the phone; a handwritten note to a dead loved one, taken from us too soon, catches our eye next to the deceased; and the smell of Newports, some still burning, hangs in the air. These spaces are the living backdrops of relationships past and present- to oneself, to family, to identity, and to the community as a whole. ASHLEY DOGGETT (b. 1995, Nashville, TN), received her BFA from Watkins College of Art, Design, and Film. She has presented solo exhibitions with Fort Houston (Nashville, TN), Channel to Channel (Nashville, TN), and Oz Arts Center (Nashville, TN). She has been featured in group exhibitions with David Lusk Gallery (Memphis and Nashville), Watkins College of Art, Design, and Film (Nashville, TN), Zevitas Marcus (Los Angeles, CA), and Zeitgeist Gallery. This is Ashley Doggett’s first solo exhibition with a commercial gallery and her first solo show at Steven Zevitas Gallery. For additional information or visual material, please contact the gallery at 617-778-5265 or by email at info@stevenzevitasgallery.com.